1 What do You need to Make mosquito repellent DIY? Natural mosquito spray diy for body and clothing is a nice solutions for those, who are aware of the scary health effects of synthetic and DEET-based repellents. How to make your own natural mosquito repellent? It is like taking a candy from a baby. In the article you will find some cheap and easy recipes to make mosquito repellent on your own. What do You need to Make mosquito repellent DIY? All you need to make mosquito repellent on your own can be purchased at home depot, market and online. 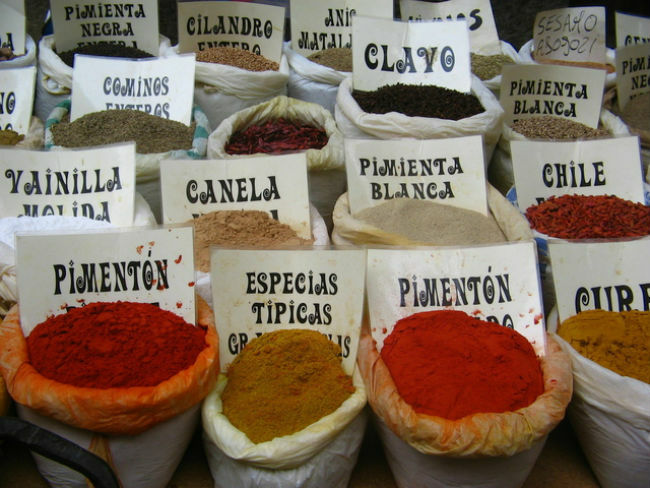 The better part of ingredients are cheap and used for everyday purposes, such as mouthwash, vanillin, sunflower and olive oil, witch hazel, rubbing alcohol, essential oils, salt, beer, vegetables and others. These products are natural and do not contain DEET and other harmful insecticides. How to make mosquito repellent diy from beer, mouthwash and salt, is described in Paul Harvey recipe. You can use garlic and pepper for mixing your spray for yards and skin. 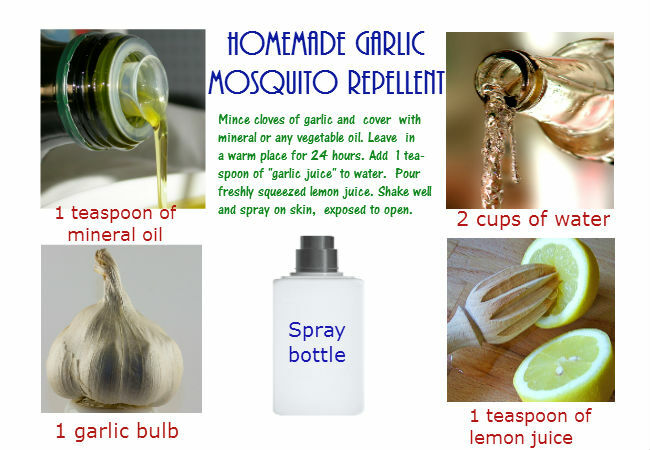 Find more information in the article “Garlic spray for mosquitoes“. Old recipe of spray from onion to deter mosquitoes from lawns can be found here. Essential oils are widely used for mixing insect and bug repellents. Here are the recipes how to make homemade mosquito repellent. Lavender is a well-known insect repellent plant. You can just pick some fresh lavender flowers in yard and rub your skin on the neck, on pulse areas of arms, on exposed leggs, behind your ears. The odor will keep mosquitoes away. You can also use lavender oil for homemade mosquitoes spray. Take the ingredients and shake well. Apply lavender mosquito repellent on exposed areas of skin before going outdoors. Store in fridge for 3 -4 days. Add essential oils of lavender, citronella and lemongrass into witch hazel and shake sufficiently. Spray on skin before walking out. Drop some TerraShield (2-3 drops) in a spray bottle, pour some water and spray on your patio, on tent or bench to deter annoying insects. Take essential oils and drop into a small bottle (0.5 oz perfume bottle). Add some rubbing alcohol or sunflower/olive oil to full and shake properly. Apply anti mosquito body spray on the skin that is exposed to open. Tea tree and Lavender are home remedies for mosquito bites as well. If you want to apply this solution on kids, mix the ingredients twice as small as mentioned in the recipe. For this recipe you should take essential oils of lemon, citronella and eucalyptus, and some water. Add extracted oils into water and shake sufficiently. Spray aruond you and on skin before going outside. To make mosquito repellent, take a tube of baby cream or lotion and a pack of vanillin, mix up and apply on the kids’ skin to repel mosquitoes. Pour squeezed lemon juice, vanilla extract and 20 drops of natural oil (lavender, citronella, geranium, catmint, eucalyptus) into a container (a bowl), stir and mix up the ingredients properly. Add the mixture to a 2-oz spray bottle and fill the water to full. Shake well before use. It is intended to be applied outdoors. Summing up, ingredients for recipes “How to make mosquito repellent” are available, safe, easy-to-mix and apply. You can combine natural substances and use these body, clothing and backyard mixtures to prevent mosquitoes from biting in yard, park, on picnic or camping where mosquitoes are not very thick and heavy. To prolongue duration, apply the mosquitoes spray each hour. Note: Essential oils for mosquito repellent recipes can be skin sensitive! Test on the skin of the inner elbow for 24 hours before applying. Do not use if your skin is irritated, injured or scratched.